Ivan Vera Mathiri an interesting title which itself creates a buzz and moreover the second outing for Vikram and the director Saravanan after their successful Kumki and Engeyum Eppothum respectively. So enough reasons to have an expectation on this movie. Did it live upto the expectation? Things which worked against the movie is its title and its trailer. Going by the trailer I thought this movie is a complete action thriller with little romance. Also the heroine has some role to play. But, it turned out to be a romantic thriller with more weightage on romance. I thought the hero is someone who does many good things for society without revealing his identity, but he does only one thing to punish the villain. He is someone who got angry and punished them that's all, doesn't continue to do such things. The screenplay was very boring in the first half even though Saravanan gets into business straight away. The romance was so slow which we have seen in many other movies. The heroine once again a cliched character, a Laila-esque. Even the second doesn't have many wow moments so the movie looks big than its running time. Songs and bgm are not much impressive passes without any impact. The Villain Vamsi really scores high than Vikram. Vikram looks fit for this character, but still he needs to improve himself more in romance and dance. Heroine is looking good and nothing more to say. 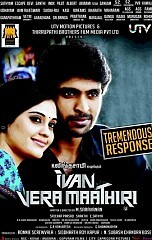 Ivan Vera Mathiri, promises to be different, but it isn't. It's a yet another commercial cinema without making any big impact. Saravanan, I expected a lot after your EE, disappointed. A national border issue for Vikram Prabhu? Vikram Prabhu - the Uthama Puthiran ! Vikram Prabhu - "I had my own doubts while approaching Vellakaara Durai"
This page has information about , Vikram Prabhu, Ivan Vera Maathiri.